Astronomers are recalculating the size of the Milky Way thanks to data from a Chinese telescope. For decades, astronomers mapped the radius of the galaxy at about 50,000 light years, with our sun situated some 25,000 light years from the center of the Milky Way. There is a clear boundary at the edge of the galactic stellar disk, and the number of stars drops abruptly beyond the boundary. But more young stars have been discovered beyond the assumed boundary in recent years, indicating the stellar disk extends further, according to data from the telescope in Xinglong County, north China's Hebei Province. 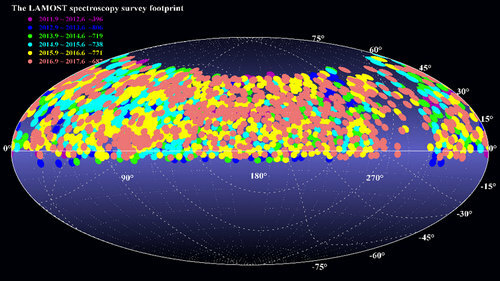 The Large Sky Area Multi-Object Fiber Spectroscopic Telescope (LAMOST), of National Astronomical Observatories (NAO) of the Chinese Academy of Sciences, can observe about 4,000 celestial bodies at one time and has made a massive contribution to the study of the structure of the galaxy. NAO astronomer Liu Chao counted the stars at the edge of the galaxy using data from LAMOST and drew a cross-section of the outer-ring of the Milky Way plane at the end of 2017. He found that stars are fewer, but do not stop at 50,000 light years from the galactic center. They extend to 62,000 light years. Since then, other astronomers, including scientists in Spain, have joined Liu's research. They found the radius of the galactic stellar disk could reach 100,000 light years.